ePublishing Knowledge BaseePublishing Knowledge BaseePublishing Knowledge Base Creating and Managing EventsHow do I remove sidebars or unrelated content on an event page? Version 2 of the Event Manager allows you to make use of the No Sidebars and Use Blank Page layout Classification taxonomies. To view your event before it is published, click the Preview button at the bottom of the Event when it is opened in the Event Managerto see the results of your choices. Ask your solutions manager if you do not know which version of the Event Manager you have on your website. 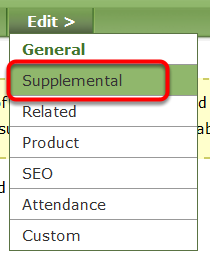 To apply No Sidebars or Use Blank Page layout / Blank Page Layout taxonomies, go to Edit > Supplemental in your Event in the Event Manager. Under Classification, select No Sidebars or Use Blank Page / Blank Page Layout by clicking the box. Zoom: Under Classification, select No Sidebars or Use Blank Page / Blank Page Layout by clicking the box. To preview your page, return to Edit > General, scroll down, and click Preview. Prev: How do I delete an event? Next: How do I create a poll?